When we lose someone we love, we find out real quick that the old saying “You can’t take it with you” is more true than we realize. When I lost my husband Larry, it was his clothing that kept bringing me down. His clothes smelled like him, and all the memories would come flooding back. I would find myself with my nose buried in his shirts sobbing. Eventually your loved one’s clothing will lose that smell, but the cloths still aren’t just cloths. They are very powerful reminders of your loved one, this shirt was the one they wore on the day you went to the fair, and this sweater was one you got for them on a family vacation. But Goodwill or a resale store might just not be something you are able to consider. 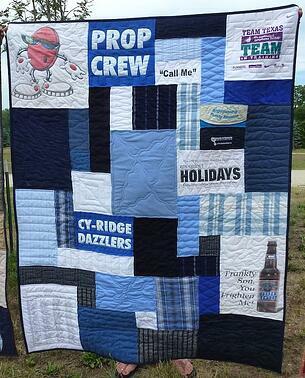 If you are looking to do something with your deceased loved one’s clothing, consider having a quilt or a pillow made. 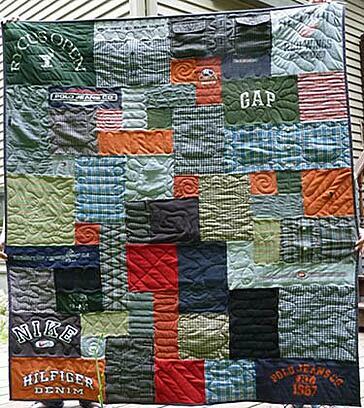 Memorial quilts are made out of the clothing and/or T-shirts from a deceased loved one. These quilts are sad and you should expect a good cry when you get them back. But over time, they will become a comfort. This will depend on you and your situation. Everyone takes different amounts of time to come to terms with death. Generally within the first month is just too soon. There are too many other overwhelming tasks to deal with. If someone wants to help by offering to haul the clothing to Goodwill for you, I would tell them, “no, I have plans for the clothing.” Just let it sit there until you are ready to start working through the closet and dresser drawers yourself or with a trusted person to help. When the time is right, you will know. But that next step of sorting the clothing might be a huge and overwhelming project. Here is a great article with a process that will let you tackle this project one step at a time. It’s worth the time to read it! Who Should Get a Memorial Quilt? Most of the time, we make more than one memorial quilt from a deceased loved one’s clothing. For example, when a parent has died and left behind school age children, we typically make one for each child and for the surviving parent. When I lost Larry, I ended up making 10 quilts for his friends and family. It was only after I shipped all the quilts out that I realized that I had not made one for myself. To this day I kick myself for not having made one for myself. If you have lost your spouse, I think it is very important to have one made for yourself. Even if you are not ready now, put some of the clothing items aside for later. Click here to read more about planning a memorial quilt for more than one person. What can be used in a memorial quilt? Here are some items you might consider. All of these items can be used. Neckties - Keep in mind that most neckties are dry-clean only, here is a link to an all necktie quilt. Socks – socks can be used in a number of different ways. Bras & Underwear – consider carefully if you really want to use them. Scarfs and handkerchiefs – Here is a link to an all handkerchief quilt. Baseball cap – we can use the logo from the cap. Athletic gear that is cloth. For example, running shorts, bicycle jerseys and shorts, and swimming suits. 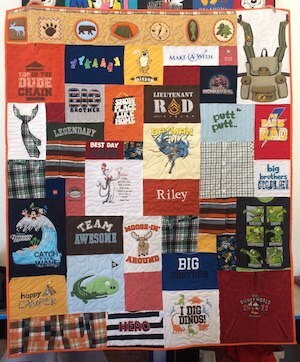 Typically a memorial quilt will cost the same as a regular T-shirt quilt. Click here to connect to our pricing page. The cost of a memorial quilt may be a little more if there are items that need additional work done with them. For example, a baseball hat takes extra work to make it useable in a quilt. We call these special items “sew-downs” because the items have to be sewn to a block before we can sew them into the quilt. There is a small per item charge. The first 6 sew downs are included in the cost of the quilt. Here are your basic steps. Click here to read more about how to have a quilt made. We have tried to keep it as easy as possible. If you are a widow/widower or the parent of a deceased child, save the items that have the most memory. It might take a year or more before you are ready to part with the clothes. But the quilt you get back will be a lot easier to snuggle with than a pile of T-shirts in a drawer. 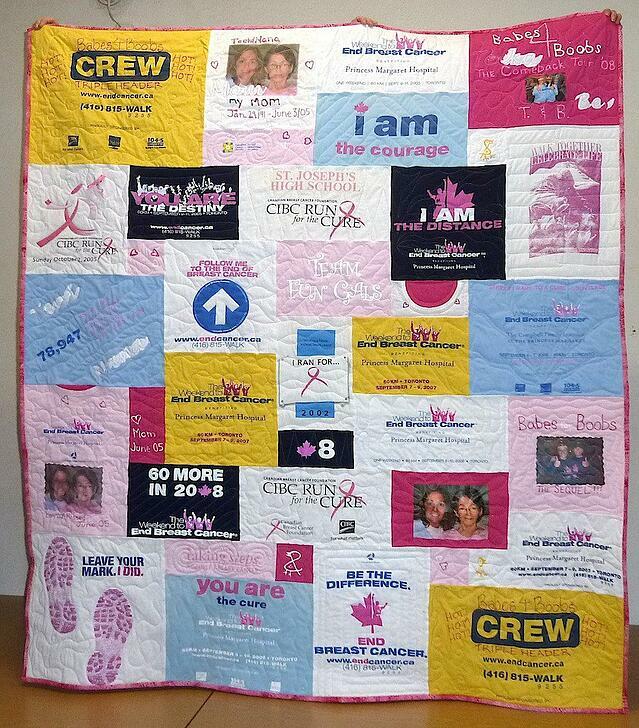 If you are a friend or extended family member of someone who has died, you should talk about this type of bereavement or memorial quilt when the time is right. Sometimes when we lose someone, the first few months are tough. But you will know when the time is right. To learn more about having a memorial quilt made from you loved one's clothing, consider downloading our Memorial Quilt guide.